No matter what the event is, people will always talk about food. 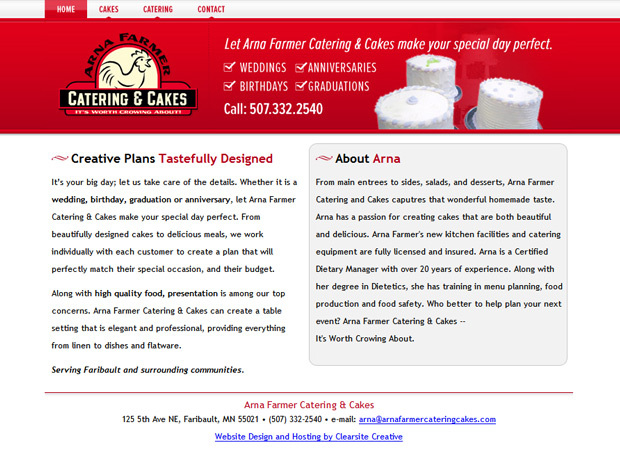 That’s where Arna Famer Catering & Cakes comes in. Arna works individually with each customer to create a plan that perfectly matches their special occasion and their budget, so that the food will be as memorable and exciting as the event itself! Our main goal working with Arna was to make her a straight forward and simple website that would make it easy for visitors to see her beautiful cakes, and view the unique services she provides. We took a cue from her existing branding and developed around it to make her website attractive and usable.